Montana Silversmiths trophy buckle #952. 3" x 4¼". 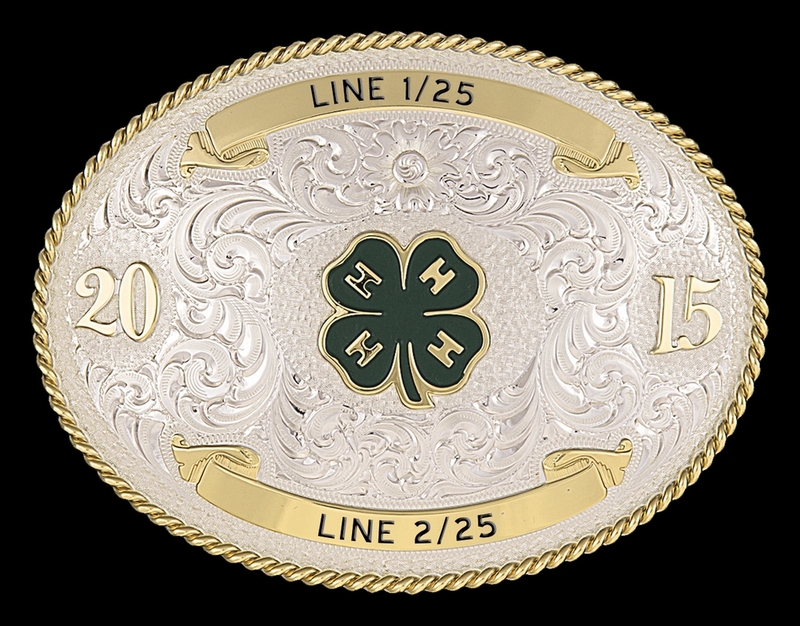 Classic silver trophy buckle with split date trim and an engraveable ribbon on the top and bottom. Silver filigree background with gold rope trim, ribbons, figure and date. Includes any figure; shown with 4-H Green Clover figure #90. Custom buckles require from 4 to 6 weeks to ship. This Montana silversmiths trophy buckle is also available in solid sterling silver (usually price x 3); contact us for a quote. Download the Catalog of Figures here. This trophy buckle is also available with an Antiqued Patina.